Leaves of twenty-two (22) species of Combretum in Nigeria were examined for occurrence and distribution of different types and sizes of ergastic substances (calcium oxalate crystals). Fresh and herbarium specimens were used for the study. These specimens were wax embedded, sectioned, mounted and micro-photographed using Leica WILD MPS 52 microscope camera on Leitz Diaplan microscope. Results revealed two types of calcium oxalate crystals—crystal sand and druses. Based on the observed differences in the size of the crystals, three groups of calcium oxalate crystals are reported [large crystals: 180.0 - 360.0 µm (241 ± 44.57 µm), moderate crystals: 90.0 - 144.0 µm (117.0 ± 20.60 µm), and small crystals: 18.0 - 72.0 µm (50.21 ± 20.42 µm)]. Crystal sand was found only in Combretum sp. 1 but druses of varying sizes predominated amongst species of the genus. Crystals were distributed within the spongy mesophyll, palisade mesophyll, subepidermis adaxial, sub-epidermis abaxial and between the palisade and spongy mesophyll. The findings of this work provide information on the occurrence and distribution of the crystals in the leaf epidermis of these taxa in Nigeria. The formation, occurrence and distribution of the crystal type in the Combretum species constitute dependable taxonomic character especially when combined with other characters. Combretum Loefl. belongs to the tribe Combreteae, subfamily Combretoideae in the family Combretaceae  . It comprises two subgenera Combretum with eleven sections and Cacoucia  . This family is highly heterogeneous and occurs mainly in the tropics, warm temperate and sub-tropical zones of the world. The members of this family are trees or small trees, shrubs or deciduous climbers, sometimes scrambling shrubs with 4- to 5-winged fruits   . Forty-nine (49) known species and 8 imperfectly known species have been reported in West Africa with 25 species occurring in Nigeria  . The genus has the chromosome number of 2n = 26 or 39 and the basic chromosome number of x = 13   and several medicinal values  - . Ergastic substances (calcium oxalate crystals) as anatomical structures have been reported to have contributed immensely to plant systematics  . Morphologically, there are five main categories of calcium oxalate i.e. raphids, prisms, styloids, druses and crystal sand  . In whatever tissue the crystals are found, they most often accumulate within the vacuoles of specialized cells called crystal idioblasts  . The number and location of crystal idioblasts within the plant body also vary among taxa. The morphology and distribution of crystals are constant within a species. This indicates that their presence, morphology, and distribution in species are under genetic control  - . Although their functional significance in plant development remains unclear, various functions have been attributed to them, including calcium regulation in plant cells  - , protection against herbivores  , detoxification of heavy metals or oxalic acid  , tissue strength, light gathering, and reflection   . Among Nigerian species of Combretum, there is limited or no information on the occurrences and distribution of ergastic substances. Therefore, this article described the morphology, distribution and occurrence of calcium oxalate crystals in the leaf lamina of 22 Combretum species (18 existing species and 4 new collections undergoing taxonomic authentication) and their significance in the taxonomic delimitation of members of the genus. The study highlights the significance of crystal size in the taxonomic delimitation of members of the genus. Anatomical studies: Fresh cut sections of matured midrib of leaves from the specimens were fixed in FAA (formaldehyde:glacial acetic acid:ethanol in the ratio of 1:1:18 parts of 70% ethanol v/v) for at least 48 hours. These were washed in several changes of distilled water, dehydrated through alcohol series (30%, 50%, 70% and 100%), 2 hours in each solution and embedded in wax. Sections were cut on a Leitz 1512 rotary microtome at thickness between 20 - 24 mm. The thin sections selected were de-waxed by passing the specimens through ethanol/chloroform in the ratios 1:3, 1:1 and 3:1 respectively and finally to absolute ethanol and allowed to stay 3 hours in each case; stained with 1% safranin or alcian blue, and mounted on slide. Photomicrographs of the anatomical sections were taken with a Leitz Diaplan photomicroscope fitted with Leica WILD MPS 52 camera. The summary of crystal types, occurrence and distribution in the leaf blade of 22 Combretum species studied are presented in Tables 2-4 and Figure 1 and Figure 2. Two types of calcium oxalate crystals (druses and crystal sand) occurred in the species with druses predominating. Crystal sand was observed only in Combretum sp. 1 (a new collection undergoing taxonomic authentication). Crystals were observed in the spongy mesophyll layer, palisade mesophyll layer, between the palisade and spongy mesophylls, between the palisade mesophyll and the adaxial epidermis (sub-epidermis adaxial) or between the spongy and the abaxial epidermis (sub-epidermis abaxial) as shown in Figure 1 and Figure 2. Table 1. Species name, locality, state, name of collector, accession number and date of collection for the Combretum species studied. Table 2. Crystal type and distribution in the leaf lamina of the Combretum species. Table 3. Summary of crystal sizes in the leaf lamina of the Combretum species. Table 4 . Distribution of different sizes of calcium oxalate in the leaf lamina of the Combretum species. −: absent; L: large crystal (180 - 360 µm), M: moderate crystal (90 - 144 µm); S: small crystal (18 - 72 µm). 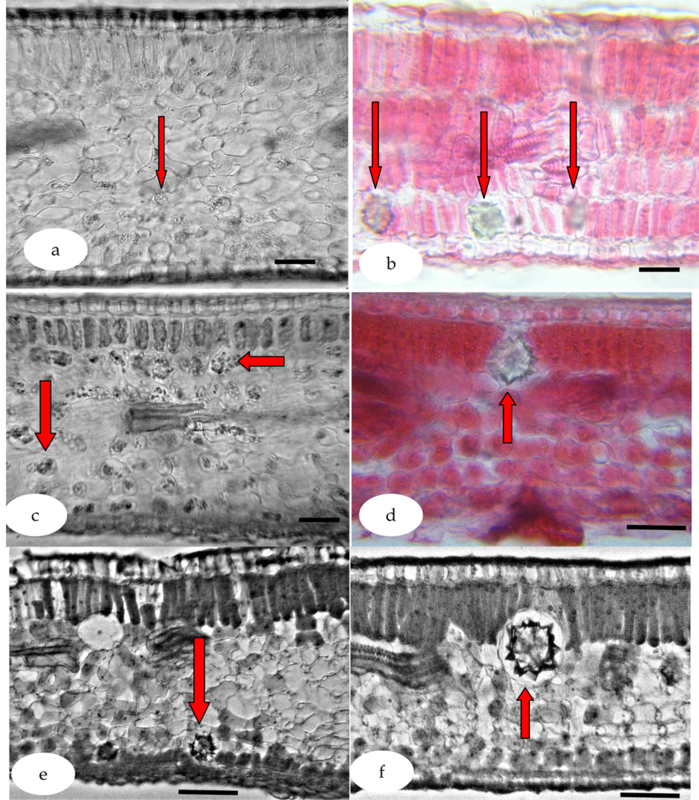 and sub-epidermis abaxial layers), C. zenkeri and Combretum sp. 3 (spongy mesophyll layer only). Based on sizes, the calcium oxalate crystals found in the species were grouped into three namely (Table 3): large crystals 180.0 - 360.0 µm (241 ± 44.57 µm), moderate crystals 90.0 - 144.0 µm (117.0 ± 20.60 µm) and small crystals 18.0 - 72.0 µm (50.21 ± 20.42 µm) (Table 3 and Table 4). Figure 1. (a)-(f) Leaf lamina showing calcium oxalate crystal distribution: (a) Combretum sp. 1 (arrow shows crystal sand), bar = 116 µm; (b) C. constrictum (arrows show druse crystals at subepidermis abaxial surface), bar = 120 µm; (c) C. mooreanum (arrows show oxalate crystals in the spongy mesophyll), bar = 118 µm; (d) C. glutinosum (arrow shows large druse crystal in the palisade mesophyll), bar = 220 µm; (e) C. micranthum (arrow shows druse crystal in subepidermis abaxial surface), bar = 240 µm; (f) Arrow shows large druse crystal between spongy and palisade mesophylls), bar = 242 µm. Figure 2. (a)-(f) Leaf lamina showing calcium oxalate crystal distribution: (a) Combretum sp. 2 (arrows show moderate druse crystal in subepidermis abaxial), bar = 240 µm; (b) C. paniculatum (arrow shows large druse crystal in subepidermis abaxial), bar = 120 µm; (c) C. paniculatum (arrow shows druse crystal in subepidermis adaxial), bar = 118 µm; (d) C. platypterum (arrows show small druses in spongy mesophyll), bar = 236 µm; (e) C. racemosum (arrow shows druse crystal in palisade mesophyll). (f) C. zenkeri (arrows show large druse crystals sandwished in spongy mesophyll), bar = 240 µm. abaxial layers but the crystals in C. bracteatum, C. micranthum and C. platypterum, which varied in sizes, occurred in the spongy mesophyll, palisade mesophyll and sub-epidermis abaxial. In C. cuspidatum, C. glutinosum, C. lamprocarpum and C. zenkeri, the crystals occurred in the palisade and spongy mesophllys. The crystals were found in the spongy mesophyll and sub-epidermis abaxial tissues in C. confertum, C. constrictum and C. insulare. On the other hand, in C. collinum subsp. binderianum the crystals occurred in sub-epidermis adaxial and sub-epidermis abaxial layers while it was observed between the spongy and palisade mesophyll in C. collinum subsp. hypopilinum. The occurrence, distribution and sizes of the crystals in the leaf blade of other taxa are shown in Table 2 and Table4 The pattern of occurrence and distribution of these crystals in the leaf lamina of the Combretum species on one hand is an indication of the similarity (where inter-species crystal occurrence and distribution are similar) and on the other hand, differences (where otherwise) within the genus. Based on the similarity of occurrence and distribution of crystals in the sub-epidermal and mesophyll layers of the leaf, the 22 species of Combretum in this study have been separated into seven groups A-G (Table 2). It is worthy to note that crystal distribution have been useful taxonomic tool in other angiosperm families. Their occurrence, distribution and systematic importance in some angiosperm families are well documented    . In their work, Lersten and Horner  showed that in Fagaceae and Nothofagaceae, some species of the sub-family Castaneoideae have crystals occurring in their veins while others lack this feature. In a similar study, Sandra and Julio  employed the distribution of the crystals on the leaf blade of Salacioideae to improve the classification of the species where calcium oxalate crystals occurrence and distribution differ from species to species. Also in Asparagales, raphid crystals were completely absent  while in subfamilies Opuntioideae and Cereoideae (Cactaceae) different morphological types of crystals have been recorded  . Similar studies of the genus Peperomia (Piperaceae) revealed three types of crystal forms with species specific arrangements to certain tissues  . In the petiole of two Lantana species, Passos, et al.,  showed that the vascular system organization pattern and the secretory idioblasts (visualized only in the cortex of L. camara) are good distinctive characteristics. The distribution and variation in sizes of crystals among these Combretum species were found to vary from species to species. Among the different species studied, the position of the different sizes of crystals in the lamina varied from one species to another. Apart from the presence of these different sizes of calcium oxalate in the different tissues of the lamina, the combination of the different sizes varied from one species to another. Based on this the species could be divided into five major groups (Table 4). The first group is distinct from other species studied and contained only Combretum sp. 1 which has only small crystals (18.0 - 72.0 µm; 50.21 ± 20.42 µm). These crystals were found in palisade and spongy mesophylls. The second group has species with only moderate size of calcium oxalate (90.0 - 144.0 µm; 117.0 ± 20.60 µm) but occurring in different tissues in the lamina. Within this group, C. bracteatum, C. zenkeri and C. lamprocarpum have crystals only between the palisade and spongy mesophylls; however, in Combretum sp. 3 and Combretum sp. 4, the moderate crystals were found in the palisade, spongy and between the palisade and spongy mesophylls. Furthermore, C. platypterum, C. racemosum and Combretum sp. 2 have moderate crystals only in the spongy mesophyll while in C. confertum and C. constrictum the moderate crystals were found strictly in the sub-epidermis abaxial layer. Third group have large calcium oxalate crystals (180.0 - 360.0 µm; 241 ± 44.57 µm) in different tissues in the leaf lamina. C. cuspidatum and C. hispidum have the large crystals in palisade, spongy and between the palisade and spongy mesophylls, C. insulare has the large crystals in the sub-epidermis adaxial and spongy mesophyll, C. glutinosum and C. sordidum have the large crystal only in the palisade while in C. paniculatum, they were found only in the sub-epidermis adaxial. On the other hand, in C. micranthum and C. collinum subsp. hyppopilinum, large oxalate crystals were found in the palisade and spongy mesophyll. The fourth group has both small and large calcium oxalate crystals in different positions in the lamina. C. mooreanum a member of this group has the small crystals in the palisade and spongy mesophyll while the large ones are found in-between the palisade and spongy mesophyll. On the other hand, C. dolichopetalum differed from C. mooreanum in that the large crystals are found in the sub-epidermis adaxial. Finally, the fifth group has only one species and this species has large and moderate crystals. The moderate crystals were in spongy mesophyll while large crystals were found in the palisade mesophyll. Though these oxalate crystals may occur in the same tissue, their sizes varied among the species, and these size variations are consistent. These results are however in tandem with Lersten and Horner  who reported predominant occurrence of large calcium oxalate crystals in the palisade parenchyma of some angiosperm. The findings of this work showed that these characters (occurrence, distribution and sizes) of calcium oxalate in the leaf of the Combretum are valuable for taxonomic delimitation of members of the genus. These therefore constitute dependable diagnostic character especially when combined with other characters for the systematics of this genus. The findings of the study also agree with previous studies which showed that crystals as taxonomic character have phylogenetic significance   - . Excel, W. (1931) The Genera of Combretaceae. Journal of Botany (London), 69, 113-128. Carr, J.D. (1988) Combretaceae in Southern Africa. The Tree Society of Southern Africa, Johannesburg. Keay, R.W.J. (1989) Trees of Nigeria. Clarendon Press, Oxford. Hutchinson, J. and Dalziel, J.M. (1954) Flora of West Tropical Africa. Vol. 1, Part 1, Crown Agents for Oversea Governments and Administrations, London. Martini, N.D., Katerere, D.R.P. and Eloff, J.N. (2004) Antibacterial Flavonoids Isolated from Combretum erythrophyllum (Burch) Sond (Combretaceae). South African Journal of Botany, 70, 310-312. Karou, D., Dicko, M.H., Simpore, J. and Traore, A.S. (2005) Antioxidant and Antibacterial Activities of Polyphenols from Ethnomedicinal Plants of Burkina Faso. African Journal Biotechnology, 4, 823-828. Cowan, M.M. (1999) Plant Products as Antimicrobial Agents. Clinical Microbiology Reviews, 12, 564-582. Franceschi, V.R. and Nakata, P.A. (2005) Calcium Oxalate in Plants: Formation and Function. Annual Review of Plant Biology, 5, 641-671. Kuo-Huang, L.-L., Ku, M.S.B. and Franceschi, V.R. 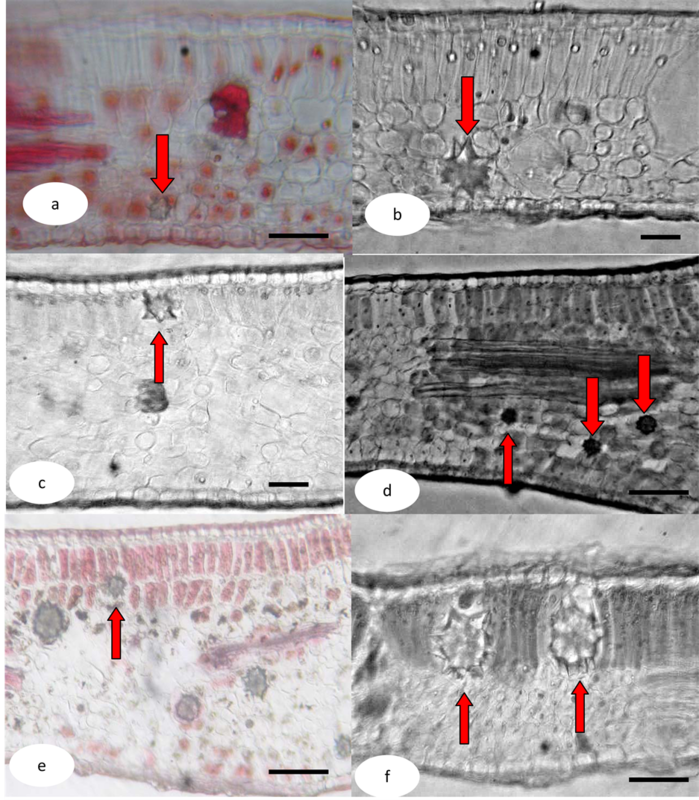 (2007) Correlations between Calcium Oxalate Crystals and Photosynthetic Activities in Palisade Cells of Shade Adapted Peperomia glabella. Botany, 48, 155-164. Passos, J.L., Meira, R.M. and Barbosa, L.C.A. (2009) Foliar Anatomy of the Species Lantana camara and L. radula (Verbenaceae). Planta Daninha, Viçosa-MG, 27, 689-700. Metcalfe, C.R. and Chalk, L. (1979) Anatomy of the Dicotyledons, Vol. 1: Systematic Anatomy of the Leaf and Stem. Oxford University Press, New York.